Mid-engined, rear wheel drive road-legal two seater SC250 in production after extensive testing programme, following unveiling of prototype at the Autosport International Show at NEC back in January 2008. Same 2.0 litre Ecotec Turbo Twin-Cam 16-valve powerplant and smooth six-speed transmission that appears in the Vauxhall Astra VXR, producing 250bhp as standard. Engine can be run on either unleaded or 99 Ron bio-ethanol, which increases performance by around 10%. 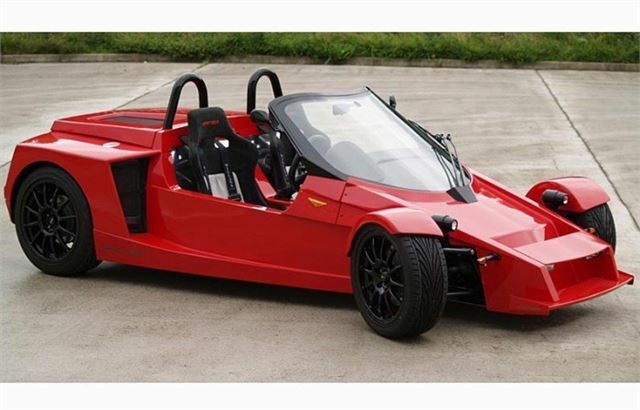 SC250 weighs 700kg (1,550lb) and has power-to-weight ratio of 357bhp-per-tonne (2.8kg/bhp). 0-60mph (0-96km/h) in under 4 seconds; maximum 165mph (265km/h). Standing 1/4 in 11.8 seconds. 236lb.ft (320Nm) torque generated @ 2,400rpm. Combined economy of 38mpg. Lightweight, hand produced composite body is coupled to an aluminium monocoque chassis with steel sub-frames front and rear. Side impact safety is aided by the honeycomb monocoque side panels that also benefit the car’s rigidity by eliminating any “flexing” of the structure. Specially designed suspension ensures premium handling regardless of speed and road/track conditions. Both front and rear suspension consist of unequal length wishbones with fixed coil over shocks supplied by Netherlands-based Intrax, the company owned by Henk Thuis who was formerly Michael Schumacher’s suspension guru at Benetton F1, with the front mounted inboard with push rod activation. Stopping power is impressive and the Tilton twin brake system features balance bar bias adjustment and ventilated 285mm front discs, with 278mm rear discs and standard General Motors calipers. An optional upgrade is available to a 4-pot caliper brake package from AP Racing. Lightweight 16 inch alloy wheels on the front and 17 inch on the rear from Team Dynamics coupled with the exceptional grip from Toyo Proxes tyres enhance the SC250’s handling, with road legal track tyres available as an option. The engine management system is controlled by an Emerald ECU and includes two settings –Standard (general road use) and Sports (track). The 12 paint colours available, ranging from ‘Cornish Gold’ to ‘Rossi Red’, are exclusive to Jetstream and are produced at MIPA’s laboratory in Germany. They are water based, which means they are not only environmentally more friendly but provide a better finish and are much easier to touch up than standard automotive paints such as cellulose. The precisely built interior cabin is designed to complement the driving experience. The custom moulded composite seats – available in two sizes - are upholstered in high-grade vinyl and can even be customised. The driver’s seat is horizontally adjustable so whether the driver is tall or short, they will be able to sit comfortably in the SC250. Willans 4 point harnesses are standard, with a 5-point version available as an option, ensuring maximum security for the driver and passenger in addition to ensuring stability when performance driving. To improve the comfort factor even more, customers can request Alcantara and leather upholstery as an option when customising their car. The digital and analogue dash display is from SPA and is programmable to add features depending on a driver’s specific requirements. The SC250 has also been designed to suit all year round usage with the addition of a water-fed heating system. A power point for an iPod, mobile phone or GPS system is provided as standard. Cars are now being built at Jetstream Sportscar’s 14,000 sq.ft. production HQ in Cornwall and take 6-8 weeks to build, with timing dependent on each customer’s required specification. Jetstream plan to manufacture 50 cars over the next year, with an uprated 300bhp version of the SC250 planned for early 2009.